Now that there is a test for three different Splashed White patterns, this page will be used to collect images of tested horses. With enough photos, it might be possible to start piecing together the visual differences between the three types. 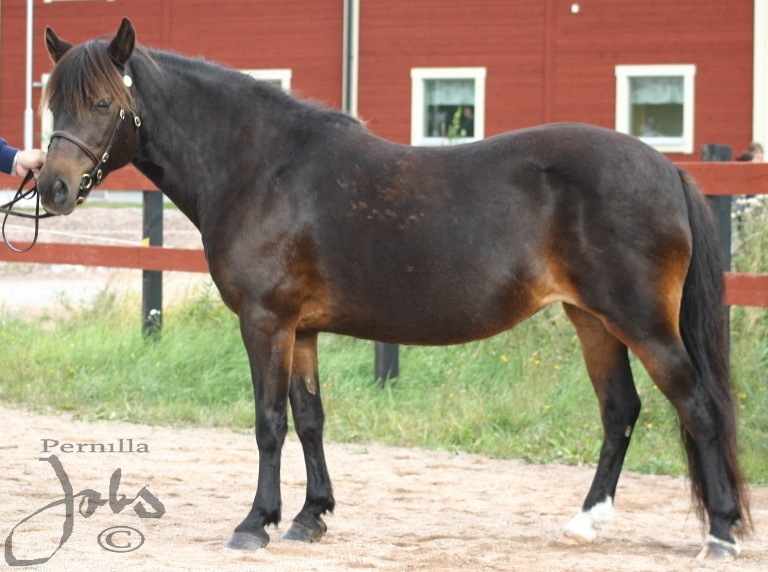 This is the mare that I will be having tested. 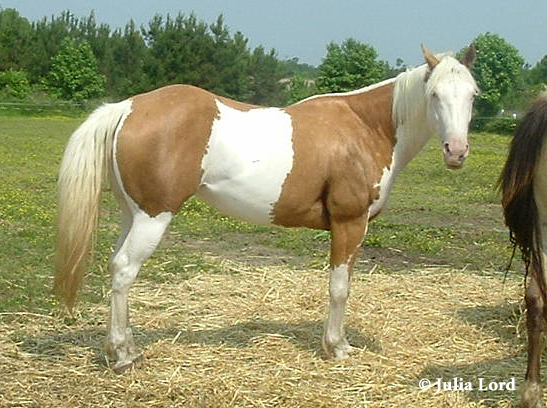 She is a Spanish Mustang. 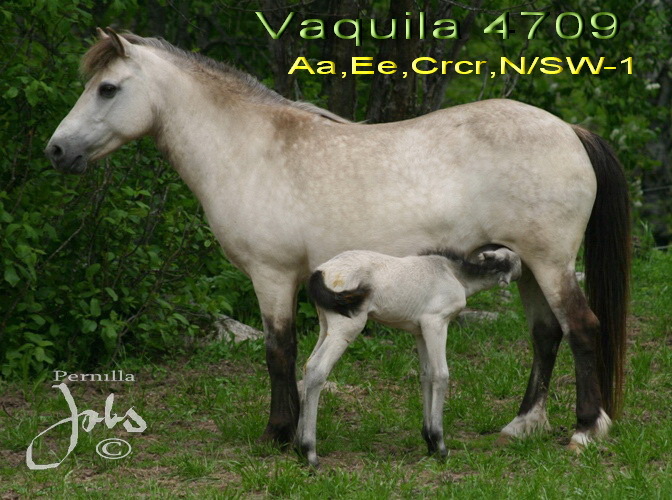 Her sire is solid grulla and her dam has just a skewed blaze and a high stocking, and blue eyes. I might be able to get hairs from her dam. Thank you so much for letting me include her! 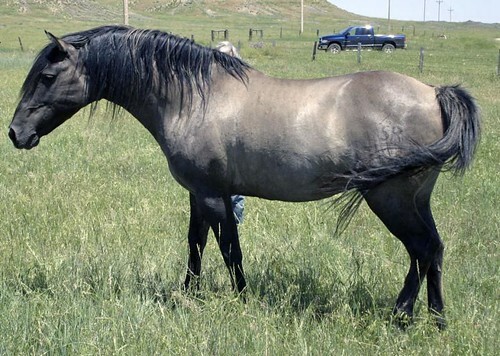 I have wondered if the pattern was present among Spanish Mustangs. Some of the historic photos of Native Americans have them on what look like frame-splash combinations. I have seen SM horses the looked very distinctly splash. It will be nice to confirm that. I forgot that her sire has a broken blaze and a snip. Hi Nicole! The address is leslikathman@earthlink.net. Just mailed photos and pedigrees on half my breeding herd (not quite but several mares and their offspring by a couple different stallions)…hopefully didn’t send too much at one time. Will be testing over the next month or so as funds are free and report results to you as they come in. Glad to be able to participate as I’ve thought I had quite a bit of splash in this bunch. Should I have any of Paisano’s get tested or wait to see if he’s positive? And what do you think about the theory of homozygous lethality in the womb? Paisano’s test will be back any day now. Her dam is a rescued TB with not but a speck of white for a star and two cornet bands, nothing special color wise. She’s grey, so you might have to go back to the earlier pictures to see her markings clearly. It’s good to see you here, Heather! And that is neat about the Gunner horses. Have any been posted publicly? I don’t know if she has posted them publicly yet. She did post them on a “closed” Facebook group, that she is pretty much adding anyone who requests to be added into. She had one test as Sw2/n and two test as Sw1/Sw2…and then some Sw1/n as well…I was just so focused on those Sw2!!! Especially the ones that have a copy of Sw1 as well. Not as loudly marked as you would expect either!!! I love your website! I have a chincoteague pony that we cannot figure out his pattern makeup at all. His head looks sabino, his midsection frame (maybe splash, hard to tell through winter fuzz), and his hind end looks classically tobiano. Though all those patterns should theoretically mix up and make him mostly white. He’s got dark eyes, an irregular blaze, white under jaw. Are you interested in testing him? I think it would be wonderful to test a Chincoteague. I don’t know that any have to date, though there have been what look like classic splash Chincoteagues born in the past. Is your pony related to Surfer Dude? He is the one that has been suspected of carrying splash. I have no idea! He’s been through a few owners last year and his papers are MIA. I don’t know if he was penned as a yearling, or if he was from a breeder. He’s not one you’d look at and say he’s a splash. You look at him and scratch your head! How does the testing work? To have a horse tested, you need to be able to pull 20-30 hairs (they must include the root). Those are then mailed with the fee ($25) to the lab at UC Davis. Fun! Let me get through this vet work we’re doing so I can pass another horse bill “under the radar” at home and will definitely test. We’re dealing with a gut full of sand at the moment… no fun. So glad we got him away from the coast! 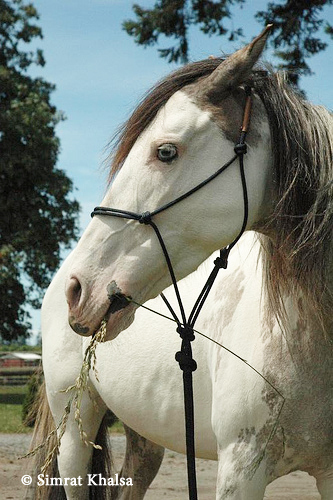 I have a purebred Arabian mare with one solid blue eye and another partial blue eye. Would she be one that you would be interested in seeing tested. You can’t say a horse with a blue eye is Splash every time though. That is so misleading. 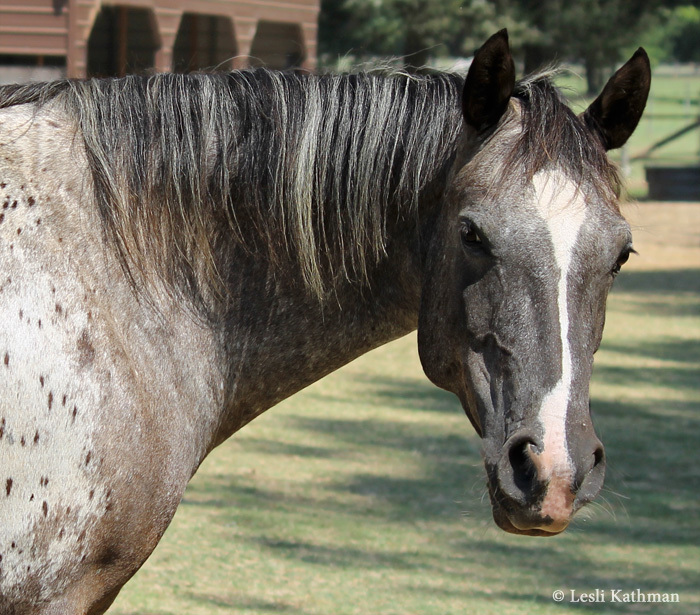 My QH mare with a blue eye tested negative to all 3 SW genes. I never thought for her to be Splash either but wanted to test her to be sure. I think you are right. I wish the suggestion that blue eyes meant splash (or maybe frame) had not caught on so widely on internet forums, because I believe the evidence available even before the tests supported the idea that blue eyes probably had multiple causes. Got my mares results today and she is NN for everything but DW (I havent tested for it yet). She has one full blue eye and about 90% white. I send you an email with her test results and a couple pics. 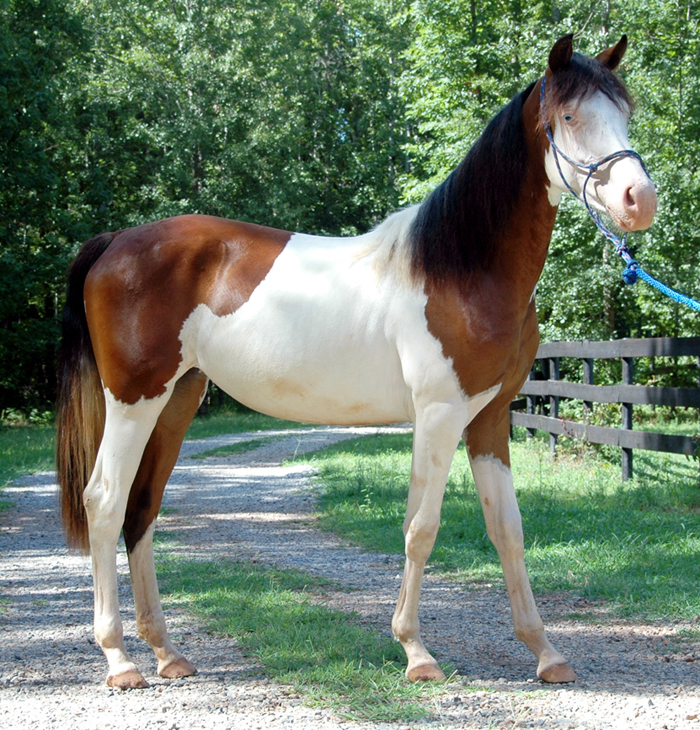 I didnt realize that the APHA ‘comprehensive’ colour test tested for Splash. My mares results came in today and she tested negative for Splash (not that I was thinking she was, but you can add her to your negative list). i am wondering- do you know if thoroughbreds can come in splash? i believe i saw one the other day, at a friends barn, one of the boarders had an unusual horse of thoroughbred descent and i believe she was a splash. the Definitely can Amber. A friend of mine in New Zealand bred a filly years ago. Her name is “Hey What The”. She went on to breed more. They now have a stallion, exactly the same pattern as her. I really don’t think she will test positive to the tests though as she so similar as the ‘Bald Eagle’ line in Australia that are all Classic Splash and test negative. Thank you for mentioning Hey What The. I suspect that she and others that appear suddenly with that kind of look (wholly white faces, blue eyes and stockings) and then pass it consistently, will prove to be new splash mutations much like SW2 and SW3. Do you know if your friend sent samples from the family to UC Davis? When last I heard, they were collecting negatives on likely horses for further study. 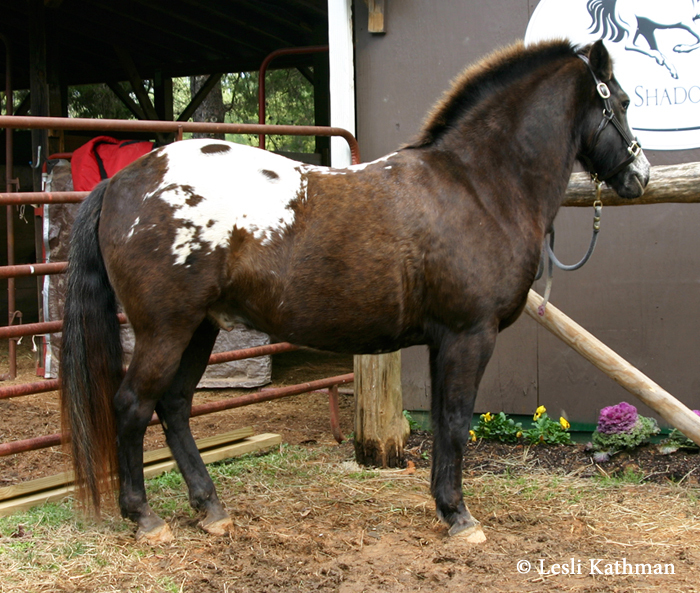 I have a picture of a chestnut OTTB with roaning and a fist sized white mark on his rump. How can i email it to you? Hi Esther! You can send me an email using leslikathman at earthlink dot net. If you send an email before you send the actual pictures, I can make sure my spam filter does not catch it first. Has anyone done any testing on Arabians who seem to carry splash? There has been some recent conversation about blue eyed arabians popping up from a certain bloodlines, but I have a feeling even if they were tested, they may not test positive for the currently identified types of splash..